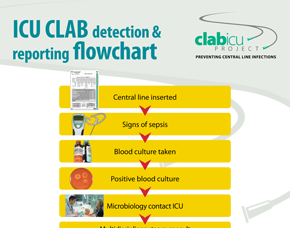 The Central Line Associated Bacteraemia in Intensive Care Units project (CLAB-ICU) is a NSW Statewide initiative that aims to improve patient outcomes, by reducing CLAB in ICUs. It advocates a standard sterile insertion practice. The project is overseen by the Intensive Care Co-ordination and MonitoringUnit (ICCMU) and the Clinical Excellence Commission (CEC), with the co-operation of the NSW Ministry of Health's Quality and Safety Branch. All level 5 and 6 ICUs are participating. CLAB ICU is the first collaborative between the ICCMU and CEC providing an opportunity for clinicians to drive change at the coal face. The project uses a top-down bottom-up collaborative methodology, based on a quality improvement program successfully implemented in the United States. It demonstrates that compliance with maximal sterile barrier precautions can result in a reduction in CLAB. The project promotes appropriate hand hygiene,skin preparation and maximal sterile barrier precautions during insertion. Intensive care specialists have developed practice guidelines and an insertion checklist to support sterile insertion of central lines. Posters to maintain awareness of current information.